Forces loyal to Libyan leader Moammar Gaddafi stormed hospitals in Tripoli and summarily executed injured anti-regime protestors who were being treated, a report said Thursday. Members of the Libyan Revolutionary Committee, the backbone of Gaddafi’s regime, “burst in hospitals and killed wounded people who had protested against the regime,” said Slimane Bouchuiguir, who leads the Libyan branch of the International Federation for Human Rights (FIDH), cited by Italian news agency MISNA. An army unit and militiamen loyal to Libyan leader Gaddafi blasted a mosque with antiaircraft missiles and automatic weapons Thursday, targeting protesters who had holed up inside. The attack, which occurred just 30 miles from Tripoli, comes as Gaddafi finds himself increasingly squeezed by antiregime forces and isolated internationally for his brutal attempts to hold on to power. Protesters inside the mosque “suffered heavy casualties,” though estimates for numbers killed were not available from witnesses, the Associated Press reports. 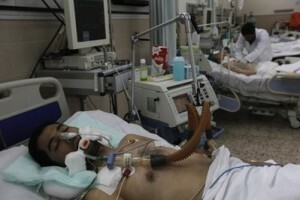 The attack was reportedly carried out by a legion of mercenaries and Qaddafi’s personal security forces. The New York Times describes the mercenary brigade fighting with an increasingly isolated Qaddafi, who may have even been deserted by parts of the Libyan armed forces at this point. Into the tenth day of revolts that rights groups claim to have killed at least 600 people, Qaddafi appeared to be losing his grip Thursday in front of an emboldened opposition and as Western nations mulled sanctions. Killing people who are already wounded in the hospital…. bombing a mosque? Yet Gaddafi is a muslim, more like a hypocrite. His days are coming… you could see the Devil inside this man. Its not only that hes killing and torturing these Libyans, but he stole 42 years of their life for his gain. Selfish dog i hope he gets slaughtered. I have a feeling he’ll kill himself before the ppl. get to him..